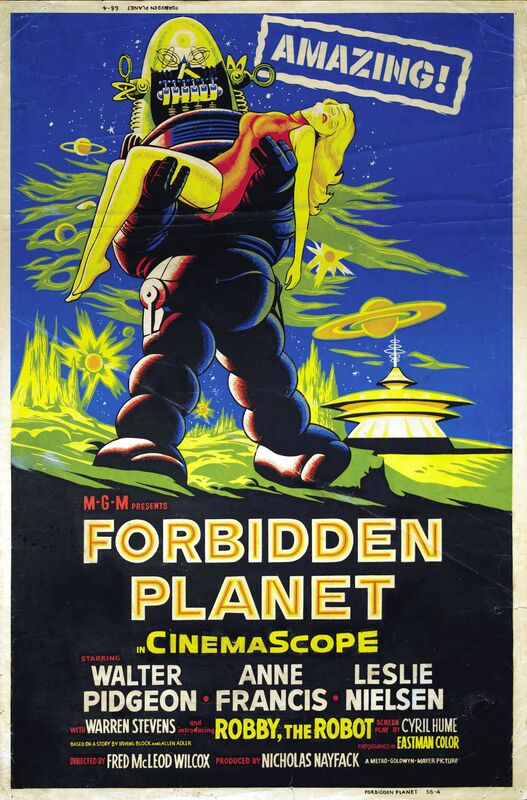 Forbidden Planet – Did You See That One? When the starship C-57D and its crew approach a distant planet they’re met by Doctor Morbius (Pidgeon) and his daughter Altaira (Francis), the only survivors of a human colony. Now Commander Adams (Nielsen) and his crew are in search of answers. Their search soon leads them to evidence of the planet’s deadly secret. This landmark science fiction film is one of the first great space operas. The film is (very) loosely based on The Tempest by William Shakespeare, and uses a story shaped by Irving Block (The 30 Foot Bride of Candy Rock) and Allen Adler (The Giant Behemoth). The screenplay was completed by Cyril Hume (Tokyo Joe). The film was directed by Fred M. Wilcox (Hills of Home). The cast includes Oscar nominee Walter Pidgeon (How Green Was My Valley), as well as Leslie Nielsen (Airplane) and Anne Francis (Bad Day at Black Rock). The story put together for this film brings out the best in 1950s science fiction. In later years, people like Gene Roddenberry (Star Trek creator) would cite it as inspiration for their own work. The theme of space exploration is nicely used to expand on the isolation of the characters both in the ship and on the planet. The story predictably introduces a love element early on, and also finds a comic element. The strength of the film is the idea that there is a galaxy of unknowns out there. It allowed the story to take big leaps in some of the more fantastic elements of the film. The movie might be predictable now, but it was paving the way for the modern science fiction stories we’re all used to now. The ties to The Tempest are almost not there, but fans of the play might find the frameworks of the stories slightly similar. Overall, this is a fun story that looks back at the beginning of science fiction as we know it. The acting in this movie features some strong performances from Walter Pidgeon, Leslie Nielsen, and Anne Francis. Pidgeon anchors the film with a great performance that really brings out the mythological feel of the writing. He also seems to bring out the authoritarian nature of his character. His role brings out just the right tone for the entire plot of the story, and he does nice work all the way through. Leslie Nielsen also does a good job in this one. I was surprised to see the star of so many oddball comedies put together such a serious performance. He does a nice job playing a serious leader role throughout this one. Finally, Anne Francis has one of the more interesting roles in this one. She plays the seductive and naive Altaira with all the right moves. In a precursor to the miniskirts of the 1960s, she shows off more than her acting skills. (This isn’t a crude film, it’s just got moments of 1950s style seduction.) She also puts together a nice performance than works within the world of the film. The rest of the cast all do their parts in making this one work. The visuals in this movie are a sample of the things to come from some of the great science fiction movies. Films like Star Wars took a number of things from the visual design of this movie. The sets create a unique world that has a depth that was not generally expected from science fiction in the 1950s. The matte paintings and visual effects really pay off in this one. This one earned an Oscar nomination for Best Visual Effects. The film also features one of the most expensive props of the era in the form of Robby the Robot. At a cost of more than $125,000, Robby would find popularity in this film and a number of sequels. The music for the film was also revolutionary, featuring an entirely electronic score that was almost without comparison at the time. This film has served as inspiration for a number of science fiction films. Perhaps surprisingly, this film was a failure in the box office on its original release. The Cinemascope Metrocolor film initially lost more than $200,000. Thanks to a re-releases in the 1970s this film found new life. Now this movie might be best considered a cult classic. If you’re a fan of classic science fiction this is one you need to see. I would also suggest this to fans of any of the stars. I give this one 3.3 out of 5 stars.